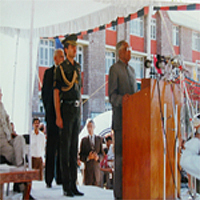 His Excellency, Shri R Venkataraman, the then President of India visited the school on 14 May 1989. 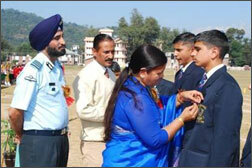 He said, “I am deeply impressed by the performance of the Sainik School both in academics & sports field. I wish them continued success”. “I am very happy to be in the school once again. The first being at the time of its inauguration by the President of India Sh Neelam Sanjeeva Reddy in 1978. I wish the school a success”. 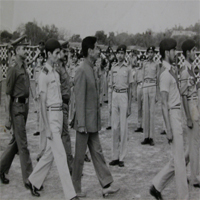 His Excellency Shri Hokishe Sema taking inspection of the parade in the year 1984. 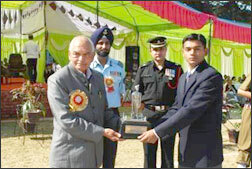 During his visit he said, “I am very much impressed by the achievements of this Sainik School & I wish them all best for their future achievements. 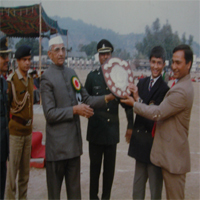 His Excellency Vice Admiral RKS Ghandhi presenting trophies to the cadets on the School Annual Function in 1986. 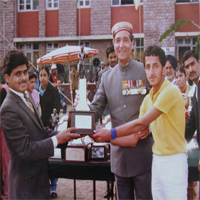 His Excellency Shri Virender Verma giving away trophies during the Annual Day Celebration of the school in 1991. 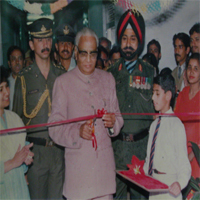 His Excellency Shri Sudhakar Rao Naik inaugurating the Science Exhibition in 1995 said, “The school has progressed a lot. I wish everyone best of luck”. Her Excellency Smt Rama Devi who visited the school in 1997 said, “I enjoyed this evening in the midst of the students & staff of Sainik School. I have no words to express myself. I congratulate the Principal & Staff for the excellent perfection they are achieving in physical fitness, mental alertness & scholastic pursuits. Above all, the discipline they are maintaining is most praiseworthy”. Honourable Education Minister of HP Shri ID Dhiman graced the ocassion as chief guest and local MLA Mrs Urmila Thakur, as the guest of honour. 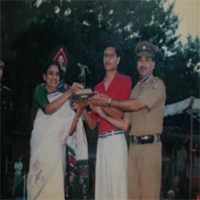 Smt Urmila Thakur awarded the academic torches to toppers and Shri ID Dhiman awarded the athletic medals and NCC Trophes.